Product #17024 | SKU BCL500 | 0.0 (no ratings yet) Thanks for your rating! 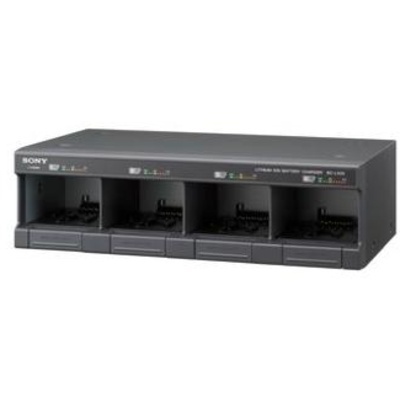 The Sony BC-L500 is a desktop-type four-channel quick charger for the BP-GL/IL/L Series lithium-ion batteries. Users can now charge up to four lithium-Ion batteries simultaneously. The BC-L500 has a compact space saving design--3U high, 19" rack mountable with front I/O mechanisms. Charges current & past model lithium-ion models:BP-GL65, BP-GL95, BP-L60S, BP-L90A, BP-L60A, BP-L40A, BP-IL75. One BP-GL95 battery can be fully charged in approximately 145 minutes. Four BP-GL95 batteries can also be fully charged in approximately 145 minutes. Charge status indicator & warning indicator is provided for wrong/damaged battery.